We all hear so much about carbohydrates, but we don’t hear a lot about protein. Many runners think that since they’re not trying to gain muscle mass protein isn’t as important. And that is where they would be wrong. Protein is essential for people who are trying to build muscle mass, but endurance athletes need just as much and ultrarunners may need more. The recommended amount of protein for the average Joe is 0.8 grams per kilogram of body weight. For endurance athletes the recommendation is 1.5-1.7 grams per kilogram of body weight. For ultrarunners, it jumps to 1.8 to 2.0 grams per kilogram of body weight. Why we need so much protein? because we push our bodies on a regular basis. And we don’t just push them a little bit. We push them beyond what most people call reasonable. We need the protein to repair those micro tears that occur through our regular training. We need the protein to strengthen our muscles when we’re doing our weight lifting throughout the week. Finally, protein is converted into energy by our bodies, requiring us to take in a little more to make sure we have enough to repair and strengthen. Our protein intake should be spread out over the day. You’re body can only process and use so much protein at a time so taking more than 25 grams at one time doesn’t do you a whole lot of good. Eating six smaller meals throughout the day rather than three large meals, makes spreading protein out much easier. You don’t have to use protein shakes either. There are many healthy sources of protein to fit any eating lifestyle. Obtaining all of your protein from animal sources has its health consequences. If you’re vegetarian or vegan, you need to make sure you are getting your protein from a variety of sources to ensure you’re getting all nine essential amino acids (there are more amino acids, but your body can produce all but nine of them). Another myth is that you need to take in so much protein within a specific length of time after your workouts because your body is primed for absorption. This is true when it comes to carbohydrates, but not for protein. There isn’t a do or die time frame for getting it in after a workout. That said, it’s best to get it in as soon as you can so you don’t get behind in your intake for the day. 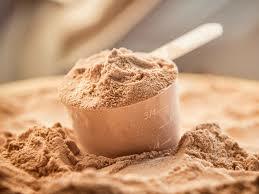 Also, protein can help with the absorption of carbohydrate after a hard workout. This is only the case when your body is carb depleted. Ever heard of the 4:1 carb to protein ration after a hard workout? It comes from this benefit. Your body’s ability to absorb protein when it is working, like in a training run or a race, is very limited. Most people are fine with about 1% of their fuel intake being protein. Much more beyond that and you could suffer some GI issues because protein is harder for your body to break down, which means it could be sitting in your stomach sloshing around for some time. Next Article How many carbs do I burn when running?